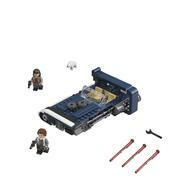 - Includes Han Solo and Qi’ra minifigures, plus a Corellian Hound figure. 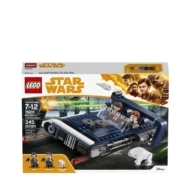 - Features an open 2-minifigure cockpit, opening hood with ammo and accessory storage, removable engine, rear storage compartment with secret cargo, hidden wheels for a hover effect, and 2 spring-loaded shooters. - Remove the engine for a much-needed overhaul. - Also includes 2 blaster pistols. - Play out epic Han Solo movie chase scenes with 75210 Moloch's Landspeeder! - Measures over 1” (5cm) high, 6” (16cm) long and 3” (10cm) wide.